First instar, within a few hours of egg hatch. A pattern is already evident: two white spots on the first abdominal segment. The legs are long in proportion to the body, with the forelegs longer than the abdomen. Plant: Maple (Acer sp. 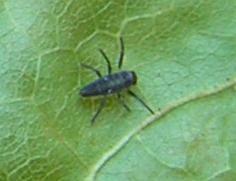 ), the same leaf the egg was laid on.